Sirius Global Animal Organisation (Sirius GAO), campaigning to end the export of domestic dogs to China for torture and slaughter for their meat and fur. "Sirius Global Animal Organisation"
Although nothing has been proved conclusively at this time (18/10/04), current scientific evidence indicates that this virus, widely recognised as being as potentially as threatening as the HIV virus, originated in the Guangdong Province of China. THERE IS NO INDICATION THAT THIS VIRUS IS SPREAD FROM ANIMAL TO HUMAN EXCEPT WHEN CERTAIN ANIMALS ARE EATEN BY HUMANS. On the contrary, it appears that this disease (SPREAD FROM HUMAN TO HUMAN) came into existance through Man's abuse of animals. We have heard reports of domestic pets being killed in an attempt to prevent the spread of this virus. THIS IS BOTH UNNECESSARY AND UNJUSTIFIED. YOU CAN NOT CATCH SARS FROM STROKING A DOG OR CAT, NOR FROM A BITE OR SCRATCH. This is a disease of our own making, that came into being as a result of the Asian lust for sampling new sources of meat. If you live in Asia, please keep your pets indoors for their own safety (more than ever before). To the Chinese people we say, "To prevent new viruses developing, please stop your obsession with eating animals that were genetically never meant to be eaten by man. We ask this on behalf of all humanity." On this page we will continue to present on-going reports behind the outbreak of the SARS virus as they become available, although the media seems to have glossed over the question of its origins. This page will be updated as often as reports allow and will often forward information that the Chinese government does not want publicised. Please visit regularly for news you may not see in your local press. 18/10/04 "China vice health minister to fight SARS in south"
14/10/04 "Humans should shoulder blame for SARS"
12/10/04 "Experts say civet is SARS source"
01/10/04 "Nothing safe from rich, hungry in China"
30/08/04 "Former newspaper editor-in-chief freed but..."
30/04/04 "Chinese lab accident raises SARS fears"
30/04/04 "China confirms SARS in deceased woman"
05/01/04 "WHO criticises China cull plans"
01/01/04 "China's Dangerous Wild Tastes"
28/10/03 "Bloody Animal Trade Thrives in Post-SARS China"
10/09/03 "Chinese Researchers Confirm SARS Came from Animals"
09/09/03 "WHO Warns of SARS Resurgence, Urges Vigilance"
17/06/03 "Animals suffer, too. It's time the Chinese learned that." 02/06/03 "Market shuts down trade on live animals"
02/06/03 "Farmed civet cats isolated in Beijing"
31/05/03 "China vs SARS: A good dog is a dead dog"
31/05/03 "China Bans Wildlife Cuisine on SARS Fears"
28/05/03 "Evidence SARS 'jumped from animals'"
28/05/03 "China raids wildlife markets, seizes thousands of animals in SARS fight"
27/05/03 "China to crack down on eating civet cats"
26/05/03 "Stopping wild animal consumption"
26/05/03 "Pets unfairly blamed for disease spread"
22/05/03 "SARS Prompting Isolation and Killing of Beijing Pets"
06/05/03 "China Is Perfect Breeding Ground for Viruses Like SARS, Expert Says"
28/04/03 "China provides clues on origins of SARS"
23/04/03 "China Animal Market Could Hold Key"
HONG KONG, Oct 18 (Reuters) - To prevent a winter return of the deadly SARS virus, a senior Chinese health official will visit southern Guangdong province this month to map out measures such as banning civet cat from menus, a newspaper said on Monday. Initiatives to be hammered out by Vice Minister of Health Wang Longde and provincial officials would include banning restaurants from cooking and serving high-risk animals such as civet cats, Hong Kong's pro-Beijing Wen Wei Po said. Chinese health experts have concluded that the civet cat, considered a delicacy in the south, was a primary source of last year's SARS epidemic. Thousands of civets were killed in Guangdong province in January because of fears they may carry a form of the virus that can jump to humans. Guangdong would be the focus of Wang's move and the measures for civet cats there would not be extended to the whole country, the newspaper said. The civet is a small carnivorous mammal found in Asia and Africa. The brown, furry creature with a cat-like body, long tail and weasel-like face has long been coveted by those who believe its tender flesh will improve their health and complexion. Severe Acute Respiratory Syndrome emerged in Guangdong in November 2002 and was soon spread by travellers. The disease eventually killed some 800 people around the world and infected about 8,000, some two-thirds of them in China, and dealt a severe blow to several Asian economies. A top Chinese health official warned on Saturday of the increased risk of infectious diseases such as SARS and bird flu jumping across the border to Hong Kong in 2005 as more Chinese travel to the southern city for work and play. Experts on severe acute respiratory syndrome prevention in South China's Guangdong province, one of the hardest hit regions in last year's SARS epidemic, reaffirmed recently that civet cats are the main carriers and one of the major animal hosts of coronavirus, which causes SARS. They said the weasel-like feline is one of the main animal hosts of the deadly SARS virus, which claimed about 800 lives across the globe last year. Since the large-scale outbreak of the virus in spring last year, incessant studies have been conducted to discover its transmission track and mechanism. The recent conclusion of the Guangdong scientists is a great step in the eventual decoding of the killer virus. Although scientists remain divided on which exact animal is the host of the lethal coronavirus, answers to this thorny question will not automatically help humankind permanently shake off the nightmare of the SARS disaster. We need to carefully reflect on our own role in it. It is our irrational lifestyle, not civet cats, that has led to the spread of the disease. For a long time, civet cats, together with other rare species, have been fashionable delicacies destined for the country's dinner tables. In the wake of the SARS outbreak, people panicked and began to blame the small mammal for the disease. Thousands of civet cats have been slaughtered in the fight against SARS. And laws and regulations came into being banning the indiscriminate eating of wildlife. We kill them. We eat them. And, then, we blame them. History teaches us that nature is vengeful when treated irresponsibly. It is high time we human beings woke up to the fact that we are not an elite of nature that can willfully dispose of other species. We need to live in harmony with them. And, we should treat other species more humanely. In doing this, we are taking care of ourselves and future generations. The SARS epidemic, together with bird flu, sounded an alarm. Even if scientists manage to find the animal host of the virus, the threat will not be diminished. Chinese health experts have concluded that the civet cat was the primary source of last year's SARS epidemic, China Radio International reported Tuesday. Research has proved that the cat was the primary animal source of the human SARS virus, with the ability to spread the virus. The experts have conducted lots of experiment on the civet cats and SARS virus. They found that civet cat is the most easily infected wild animal. GUANGZHOU, China, Oct 1 (Reuters) - In southern China, it doesn't matter if an animal is an endangered species. As long as it walks, wriggles or jumps, it's good enough for the pot. To prove the point, visit a wild animal market in the thriving city of Guangzhou. "You want to buy a porcupine?" a worker asked as he looked up from a half-disembowelled civet cat, which some scientists say is the source of the deadly SARS virus that wreaked havoc around the world last year, killing more than 800 people. Squatting just next to him, a few workers scrub the white carcass of a freshly plucked porcupine, a protected species under the U.N. Convention on International Trade in Endangered Species (CITES). Nearby, half a dozen other people sit around mounds of water snakes, peeling their skin off and revealing a pink stretch of flesh. Water snake meat is relatively cheap and popular but conservationists have warned the trade is endangering the reptile, once abundant in the wild. In this dark, foul-smelling market in Guangzhou, traders have just about anything to offer from birds and waterfowl, domestic dogs and cats, to the exotic flying squirrels and leopard cats. What cannot be supplied legally from farms are hunted from the wild, or imported, as well as smuggled, from overseas. It's the sort of unbridled trade that led to CITES being created decades ago and signatories to the convention, including China, will be gathering in Bangkok for a 12-day summit from Saturday. Chinese officials cracked down on the trade of wild game and protected species after SARS last year. But instead of destroying the age-old industry, the government has driven it underground. Traders are a lot savvier these days. In the Guangzhou market, species that are endangered or deemed sensitive are hidden and workers quickly remove cages with suspect inhabitants or throw sackcloths over them when strangers mill about. And it is obvious that there is more than meets the eye. "A catty of porcupine costs 20 yuan (US$2.40). An average porcupine would weigh between 10 and 20 catties," said one worker, pointing to the carcass of the CITES-listed animal. A catty is a widely used Chinese unit of weight and is equivalent to 617 grammes or about 1.4 pounds. Conservationists say CITES-protected species are readily available in China, where consumers are so hungry for things exotic that many new species have become endangered and concern groups find they cannot give protection quickly enough. Gail Cochrane of Animals Asia Foundation said the Malaysian Box Terrapin, which was abundant in the wild just 10 years ago, had to be added to CITES's Appendix II two years ago, which means trade in the animal is strictly controlled. "Within a very short time, or about five to 10 years, these turtles have become very rare and have needed to be CITES-listed. Just in the last two years, 12 to 13 species have had to be CITES-listed because of China's food trade," Cochrane said. Water snakes were also in danger. "They are not CITES-listed now but they are fast disappearing because of overhunting. Due to domestic consumption, they are becoming rare and are being imported from Southeast Asia. If we don't watch out, they will get listed," Cochrane said. But so long as customers can pay, markets and wild game restaurants in China will continue to be stocked with endangered species either by local hunters or smugglers. Leopard cats, once abundant in China, are now smuggled from Vietnam and Burma. Porcupines and pangolins are supplied from Vietnam and Thailand, Cochrane said. All three are CITES-listed. These animals were readily available for decades in restaurants in southern China, but many of them are now more discreet after officials cracked down on the trade of endangered species in the aftermath of the SARS epidemic. While top Chinese officials have condemned the eating of wild game as barbaric, it has done little to dent a habit that has lasted for as long as the Chinese race. Many Chinese believe wild game improves health and keeps them warm in winter. In the rural town of Chonghua, about two hours' drive from Guangzhou, the wily owner of a tiny wild game restaurant charges 360 yuan for a catty of the endangered pangolin. "We have everything you want," the restaurateur said. "But you will have to buy a whole pangolin if you want to see it (before it is butchered). That would be over 20 catties." "Hey, this thing is CITES-listed. If I get caught with it, it will cost me over 100,000 yuan (in fines)." While traders in the Guangzhou wild animal market also prefer to sell endangered species to trusted customers, trade and processing of water snakes are openly conducted. "They cost about six yuan to over 10 yuan every catty," one worker said. "They are from all over the country and are farmed in ponds and rivers. 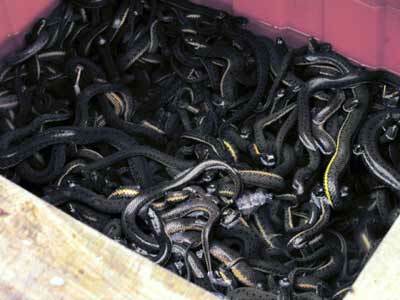 The baby snakes that are too small are returned to the farms and will be sold when they get bigger." Reporters Without Borders (Reporters sans fronti�res) today welcomed the release of Cheng Yizhong, former editor-in-chief of the daily newspapers Xin Jing Bao and Nanfang Dushi Bao but called on the authorities to free two other editors on the outspoken Nanfang Dushi Bao who were arrested more than five months ago after the paper reported on the SARS epidemic and other taboo subjects. The worldwide press freedom organisation said it hoped Cheng, whose release from preventive detention was announced anonymously by the papers' staff, would be allowed to work as a journalist again. It appealed for journalists Yu Huafeng and Li Minying, who were sentenced to prison terms, to be freed as well. Cheng was reportedly released on 27 August by Guangzhou police and allowed to return home, where some sources said he was put under house arrest, suggesting he would not be able to work as a journalist. The authorities have not confirmed his release. He had been detained without being charged since 20 March. The law allows people to be held for six months in this way, which means police are supposed to present the results of their enquiry into the case by 20 September. For the third time in less than a year, a failure in laboratory containment appears to have caused an outbreak of severe acute respiratory syndrome (SARS). The most recent incident occurred in China's leading SARS research laboratory, at the Center for Disease Control and Prevention in Beijing. So far, eight people are confirmed or suspected of contracting the disease, and one person has died. Authorities have closed the laboratory, and more than 200 institute employees have been quarantined. Chinese authorities have confirmed that a woman who died Apr 19 had SARS (severe acute respiratory syndrome), marking her as the world's first victim of the disease this year. The woman, surnamed Wei, was the mother of the 26-year-old medical student from Anhui province who was the first to fall ill in the outbreak, according to Xinhua, the Chinese government news service. The confirmation of Wei's case raises the number of confirmed cases in the outbreak to five. Four other cases remain in the suspected category. Wei's case was confirmed yesterday on the basis of laboratory tests and her history, Xinhua reported today. The Associated Press (AP) listed her age as 53. Wei's daughter, surnamed Song, has had a normal temperature for the past week and is recovering, Xinhua said. Another confirmed case-patient, a 20-year-old nurse surnamed Li, has had a normal temperature for 2 weeks and is in stable condition, the agency said. Yesterday Chinese officials confirmed what had been suspected SARS cases in Li's mother and aunt. Li's mother is now in "relatively stable condition" with a normal temperature, but her aunt is in critical condition, Xinhua said today. Li's mother is 44 and the aunt is 36, according to a World Health Organization (WHO) statement issued yesterday. Li became ill after caring for Song in a Beijing hospital early in April. Li was hospitalized Apr 7 and was visited by her mother and aunt Apr 8, the WHO said. The WHO described Li's mother and aunt as "part of a third generation of cases that includes the nurse's [Li's] father and two other patients hospitalized on the same ward, including one patient who shared a room with the nurse." Seven of the eight suspected and confirmed case-patients were being treated in isolation in Beijing's Ditan Hospital as of yesterday, the WHO said. Xinhua said that 43 contacts of the patients in Beijing and 39 people who had contact with Song have been released from medical observation. Previous reports said a total of about 1,000 people, most of them in Beijing, had been quarantined and under observation. The AP reported today that Chinese travelers were being checked for fever before being allowed to board trains and planes on the eve of the weeklong May Day holiday. The World Health Organization has criticised Chinese plans to slaughter 10,000 civet cats in an attempt to curb the spread of the deadly Sars virus. The news comes as the organisation said tests confirmed China's first case of the illness in six months. Researchers in Hong Kong have linked the strain the victim is carrying to a similar virus found in civets in China. But the WHO said slaughtering the animals could pose a public health risk and may destroy scientific evidence. Officials in China's Guangdong province said they hoped to complete the civet cat slaughter by Saturday. But the WHO said the move was radical and that the man's case remains an isolated one which does not constitute a public health emergency. It also warned that not enough research had been conducted into possible links between the civet cat and Sars (Severe Acute Respiratory Syndrome). "At this point in time... without seeing that data, there is no conclusive evidence that civets are the animals that carry the Sars virus," WHO Sars team leader Judy Hall told the BBC. "We would call on the government of China to do a risk assessment before slaughtering these animals." Civets are small, weasel-like animals considered a delicacy in China's Guangdong province. Many researchers believe the strain of Sars which killed hundreds of people last year in China and across the globe could have jumped species to humans from an animal like the civet. Zhong Nanshan, director of the Guangzhou Institute of Respiratory Diseases, told a Hong Kong news conference on Monday that the virus in the latest case appeared to be slightly different to that which originated in Guangdong in November 2002. Mr Zhong said the suspected Sars carrier - a male 32-year-old television producer - had claimed not to have eaten any wild animals before he fell ill, but did admit to touching at least one rat. The man is currently in hospital in the city of Guangzhou in the Guangdong province. An additional 25 people who had contact with the patient have been isolated, but none appears to be infected. Sars killed 349 people on China's mainland last year during the global outbreak. A while back at Lang Son, a northern Vietnamese town on the Chinese border, I watched as hundreds of Vietnamese carried baskets of monkeys, pangolins, snakes and a variety of exotic birds in rattan cages on their backs. On the way back, their baskets held a different fare: electric fans, water pumps, rice cookers, farm tools, TVs, VCRs, and Chinese-manufactured designers jeans and T-shirts. As one young man put it, "I can always sell forest animals to China. They buy everything we have. They have a big appetite for wild taste." In China, these forest creatures � rare and growing rarer by the minute � are transformed into pills and powders, soups and stews, and traditional medicine sold at specialty shops. The penchant for ye wei � literally, "wild taste" � is paradoxically as unstoppable as China's great leap forward toward capitalism and modernity. But ye wei depletes the forest of animals, and it causes diseases. SARS, which killed hundreds of people in China and left 5,300 Chinese sick with pneumonia earlier this year (and nearly brought China to an economic standstill) is believed by scientists to be linked to the civet cat � a favorite Chinese ye wei dish, preferably in a stew. China can jail dissidents, control public information and put a man in orbit while boasting a phenomenal 9 percent economic growth rate, but it cannot control its own people's appetite. In fact, last August the Chinese Forestry Commission lifted a four-month ban on the trade and consumption of exotic wild animals, despite warnings from the World Health Organization (WHO). China included one stipulation: all of the 54 exotic species the Chinese are again allowed to eat, including the civet, must be farm-raised, not caught in the wild. But differentiating between a farm-raised forest animal and a captured one in China is as difficult as separating pirated Britney Spears CDs from legitimate ones. Besides, China's porous borders with its Southeast Asian neighbors will always insure a steady flow of fresh exotic meat. Overall statistics on the amount of wildlife being consumed are not known, but there are some local guesses. The China Wildlife Conservation Association estimates that in Guangdong province alone, 50 tons of wild frogs, 1,000 tons of snakes and several thousand tons of wild birds are consumed in special stores and restaurants each year, not to mention badgers, bats, pangolins and other mammals. Wild taste is valued because of its increasing rarity and because of an old belief system that holds that eating wild animals is key to health, especially for virility and a strong immune system. But nature is not always so benevolent. Nature can also hurt � or, as some environmentalists argue, fight back against human encroachment � with deadly diseases like ebola, AIDS, and now SARS, all of which are suspected by many to have originated among people who ate or handled bush animals. Odd that the fanciful Chinese longing for "wild taste" is so enormous in a country otherwise known for its practicality. China's one-child policy has admirers in some quarters, and even the Communist Party has adopted an "If you can't beat them, make them join you" attitude, inviting even multimillionaire capitalists within its ranks. But for humans, practicality goes out the window when it comes to eating habits. According to Jared Diamond in his brilliant book, "Guns, Germs and Steel," one acre of farmland can feed 10 to 100 times more people than hunting and gathering on one wildlife-rich acre. Wild animals that haven't already been tamed thousands of years ago, Diamond says, will not be tamed now, because of their relatively low nutritional value compared to the time and resources necessary for domestication. Yi wei, then, is a culture of nostalgia, a way of life borne of necessity long ago and showing renewed vigor in a modernizing China. Those monkeys sitting on the Vietnamese porters' backs are there because a growing army of nouveaux riches with dispensable income want them. A pound of civet cat sells for around $6, or 10 percent of an average worker's monthly salary; monkey meat brings three times more. In fact, the Vietnamese porters I saw wouldn't dream of eating their catch. What one's grandfather used to eat out of necessity to supplement his poor diet is now worth the grandson's monthly wages � and belongs to Rolex-wearing businessmen in cosmopolitan Hong Kong or Shanghai who wouldn't know the first thing about finding monkeys in the forest. GUANGZHOU, China � Of all the animals in the Xinyuan market, the rats may be the cleanest. Even shoehorned into crowded metal cages, the plump rodents with the long, twitching tails somehow keep their white coats nearly spotless. Too bad the same can't be said for their surroundings. Along both sides of several long, dark aisles, traders and their furry wares share cramped quarters that emit a pungent funk. Exotic creatures headed for the dining tables of southern China are slaughtered here within splatter distance of workers' dinner trays. This wild animal market, which stocks pigeons, dogs, cats, snakes and species too numerous to list, isn't just a Noah's Ark for those who see a rat and think "entree." Markets like Xinyuan are where scientists believe the deadly SARS virus may first have jumped from animals to humans. After the fatal disease emerged here last November, the government eventually prohibited the sale of 54 animals. But in August, brushing aside criticism from public health experts, Beijing lifted the ban. Now, falling temperatures have Chinese authorities bracing for SARS' possible return with the onset of cold and flu season. Across the country, local officials have readied hospital beds, tightened public-health surveillance and mounted propaganda campaigns. But in southern China's markets, potentially deadly habits persist. "Wild animal markets present a kind of unique problem," says Robert Dietz, spokesman for the World Health Organization in Beijing. At the Li Ying restaurant in the city's Xiguan neighborhood, a signboard advertises meals of cat, goat, sheep and rabbit for 20 yuan or about $2.40. Assorted birds are $3.85. "I eat snake and civet cats," says She Qingqiang, 42, an interior designer standing out front. "If you invite me to eat them now, I will." Scientists say they believe that SARS, which infected more than 8,000 people worldwide and killed 774, originated in a wild animal. It then spread to another animal species before jumping to humans in a place like Xinyuan. Traders here live in small apartments above the open stalls filled with the creatures they sell. All day, every day, the men and women live, eat, play and sleep in close proximity to their animals. The traders are carrying on a way of life that has existed for as long as anyone can remember. And though scientists say there were a number of SARS cases in markets like this, people whose livelihood is at stake insist no one here has come down with the disease. Indeed, they blame almost anything other than conditions in their market for SARS, including the weather. "It's because of pollution. Too many cars, too many people," says a snake dealer who will give only his surname, Xiao. Many of these men and women are still suffering financially from the three-month ban on selling the 54 wild animals. The government granted them a temporary tax holiday to help offset the lost sales. But that ended last month. And traders say it remains difficult to secure government approval to import certain animals from farms in neighboring provinces. Meanwhile, area restaurants report lingering unease among diners about eating especially exotic fare such as a mask-faced animal called the civet cat. An expensive delicacy, the creature was singled out in initial studies this spring as a possible source of the SARS virus. At Guangzhou Bamboo Villa, the menu boasts wild pig, deer, eight different kinds of snake and assorted birds. 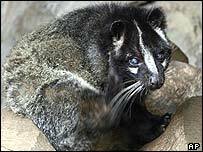 Civet cat is available at about $10.40 a pound, but few people request it. "The people are just scared. They don't want to take the risk of eating civet cat or snake. So they eat more vegetables and specialties made from small animals," manager Chen Yongjian says. The consequences of these shifting tastes are felt in the crowded aisles of Xinyuan. Slumped in a pink plastic chair adjacent to a cage of fat rats, a 32-year old woman wearing an incongruously neat olive skirt frets about mounting bills. A few years ago, she and her husband gave up growing wheat and rice in neighboring Hunan province to become animal traders. Now business is so bad, they might have to retrace their steps. "I'm thinking about going back to the field. I can't even afford the rent," says the woman, who would only give her surname Liu. A high percentage of the first SARS patients were food handlers and people involved in the wild animal trade. In subsequent studies, a virus 99.8% identical to SARS was discovered in one market's civet cats and raccoon dogs. "The markets provide a venue for the animal (SARS)-like viruses to amplify and transmit to new hosts, including humans, and this is critically important from the point of view of public health," said a September study in the journal Science. 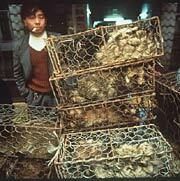 Scientists have not conclusively proved that SARS originated in the animal markets. And they remain unsure what specific animal is the natural "reservoir" of the virus. But Meirion Evans, a University of Wales epidemiologist and member of a WHO team that investigated SARS' origins, says the "most likely explanation" is the disease started with a wild animal. To date, the virus has not been detected in farm animals. As a result, the WHO would prefer the animal markets be closed. But it hasn't pushed the Chinese government to do so, fearing that a formal ban would simply drive the trade in exotic animals underground. Traders already have demonstrated a willingness to skirt existing regulations. Xiao, the snake dealer, at first told a reporter he hadn't sold any snakes for months. He was awaiting government approval, he said. Moments later, he conceded that he actually had sold more than 50 pounds of snakes just a day earlier. Gesturing at the reptiles coiled in plastic basins before him, he complained the total was still well below his break-even point. All of the traders here say that they are more fastidious about hygiene since SARS. One look around makes that claim hard to take seriously: A bare-chested trader sits behind a wooden table topped with raw meat. The bodies of four dead birds litter the floor, adjacent to a furry corpse. Nearby, children run and play in the slippery muck. The casual attitude toward health isn't unusual in China. This remains a country where men and women enthusiastically spit in public, even in affluent cities such as Beijing or Shanghai. People eat from common plates and male drivers urinate in plain view by the side of almost any road. Such customs reflect an indifference to strict health standards widespread in the developing world. In poor countries, people often don't have the luxury of worrying about remote dangers like SARS. They're too busy working to live. GUANGZHOU, China - Two little boys giggle as they play hide and seek among hundreds of filthy cages packed tight with civet cats,dogs,porcupines and squirrels. Health experts fear that wild animal markets like this one in southern China's Baiyun district could be the source of the next SARS epidemic that many fear will emerge this winter, but traders and workers here could not be more oblivious. Amid the stench of death and decay, traders of exotic animals - a culinary delight for many southern Chinese - haggle over prices with customers, occasionally turning their attention to their children, pinching their cheeks or tousling their hair. Narrow passageways are strewn with animal dung, urine, entrails and grimy fodder. "What's there to be afraid of?" asked Mrs. Huang, carrying her three-month-old daughter on her back. "We have been working and living here for years and we have had no problems." A few steps away, men with iron pipes clubbed a dog unconscious and slit its throat. Others squatted around another dead dog, plucking it clean of hair with their bare fingers. Virologists believe that such markets in China and farms where people live in very close proximity to animals are fertile breeding grounds for disease and viruses. China banned the wild animal trade and shut the markets in May, around the time that scientists in Hong Kong identified viruses in a civet cat and raccoon dog that were almost identical to the SARS virus that had infected more than 8,000 people around the world, killing more than 700 of them. The finding gave credence to widespread speculation that the virus, which first surfaced in southern China last November, may have jumped the species barrier from animals to humans. But when Chinese experts failed to verify the report, the trading ban was lifted and the markets reopened in August. Civet cats, which are not true cats but are related to the cat family, have also returned to the menus of many restaurants in Guangdong, China's most prosperous province. In February, a doctor from Guangdong infected with SARS traveled to neighboring Hong Kong, one of just hundreds of thousands of people who cross the border each day. Visitors to Hong Kong then unwittingly carried SARS to more than 30 countries around the world. SARS: ANIMAL VIRUS OR BIOCHEMICAL WEAPON? Beijing, stung by worldwide criticism after it tried to cover up the initial SARS outbreak, has ordered that all wild animals destined for dinner tables must be reared on farms, where they can be monitored for signs of disease. But many animals in the Baiyun market were missing limbs, clear indicators that they were trapped in the wild. Left to bleed and confined in cages so small and crowded that they could not move, many were badly infected and barely alive. Still, animal traders are dismissive of what experts have to say about the possible origins of SARS. "SARS cannot have anything to do with the civet cat or any animal that's sold here. They are a part of our lives and there is no one here I know who has died," said Yang Dong, 25, who has been in the wild animal trade since leaving secondary school. "I am hardly ever ill and I eat civet cats all the time," he said, flexing his arm muscles proudly. Standing with one foot on a cage with a civet cat gnawing the sole of his shoe, Yang said of SARS: "I bet it is caused by some biochemical weapon." 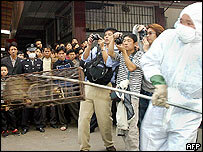 However, a recent study in Guangzhou found SARS antibodies in about 13 percent of animal traders, indicating that they had been exposed to the virus. One of many unanswered questions about SARS is whether people with mild or no symptoms can infect others. The civet cat has long been highly prized for its tender meat, which is reputed to help blood circulation, but there are growing signs that more Chinese believe it could pose a health threat. An average civet cat, similar in size to a typical house cat, used to command up to 800 yuan ($98). Since the SARS outbreak, they sell for only 200 yuan. But few medical experts believe that the trade is about to disappear. Demand is especially strong in winter, as Chinese believe that wild animal meat helps keep the body warm. "It's hard to stop a trade that is so old. If it must go on, then we should have it properly regulated and monitored," said Guan Yi, a microbiologist at the University of Hong Kong. No one knows how much the wild animal trade is worth, although traders at Baiyun claim over a million yuan a day changes hands. 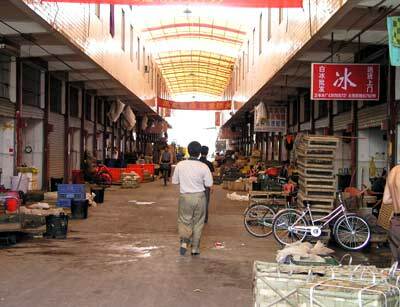 Trader Yang suffered losses for the first time when officials closed the Baiyun market this year. "I lost over 10,000 yuan. But even I am among the lucky ones. Some of my friends lost several hundred thousand!" Yang said. Genetic testing of animals sold as delicacies in a southern Chinese market confirms suspicions that the deadly SARS virus jumped from animals to people, Chinese researchers said on Thursday. The researchers found clear differences between the animal and human versions of the virus, but said they were minor enough to show that SARS jumped from animals, as influenza and other viruses have done. "It's a landmark discovery," said Kathryn Holmes of the University of Colorado Health Sciences Center, a leading expert on the coronavirus family that SARS belong to. "The question that everyone has had is, 'how did this virus appear in the human population?"' Holmes added in a telephone interview. "This is the first major clue about where the contact might have come from." Severe Acute Respiratory Syndrome emerged in southern China last November. Its symptoms include severe pneumonia. Between November and May SARS infected an estimated 8,500 people in 30 countries, killing more than 800. It spread as far as Toronto, killing 41 people in Canada. SARS had never been seen before and it took several months to determine that it was caused by a coronavirus, a member of a family of viruses that causes cold-like symptoms in people and a range of diseases in animals. But the SARS coronavirus is genetically unique and the search was on to find its source. Yi Guan and colleagues at the University of Hong Kong tested eight animals taken from a market in Shenzhen. They also tested 95 workers at the market and patients hospitalized for diseases other than SARS. The lead suspect was a palm civet, a raccoon-like animal valued as a delicacy. They also tested other animals including a raccoon dog and a ferret badger. In the animals they found antibodies to a coronavirus similar to SARS and the virus itself. "Since we detected SARS-like coronavirus in several different species of animals from the market, it suggests that markets may be an important source of human SARS," Guan said in an interview conducted by e-mail. Guan said it is too early to say whether the civet or some other animal was the primary source of the epidemic. "This paper doesn't prove that the animal host is a palm civet. It says they also could be infected with related virus. They could have gotten it from eating a mouse or something like that," said Holmes, who helped confirm the findings. Guan's team also found that many of the workers had antibodies to the virus but had never been sick. None of the hospital patients tested for SARS had any evidence of exposure to the virus. Having antibodies to a virus suggests that a person was exposed but the immune system fought it off. Holmes said an important question is whether the antibodies were to human SARS or to the slightly different animal virus. "Was it mutated or not mutated?" she asked. "Had it received the mutations that allowed it to transmit to humans or not?" Writing in the journal Science, Guan and colleagues said they found an important clue. The human version of the coronavirus was missing a genetic sequence -- a long one -- that suggest what changes were needed to make the virus infect humans. One human patient was infected with an intact virus, but most of the others were missing this sequence, they reported. MANILA - The head of the World Health Organization warned health specialists yesterday of a possible resurgence of the deadly SARS virus later this year and urged countries to boost surveillance. "None of us can predict what will happen later this year. Will SARS come back or not?" director-general Lee Jong-wook told a five-day WHO regional committee meeting in Manila. "We have to prepare on the assumption that this will come back. Our challenge now is to enhance surveillance networks that will detect and deal with SARS if it does come back," Lee said in his opening address. Severe Acute Respiratory Syndrome killed more than 800 people after it apparently jumped to humans from animals in southern China late last year and was then spread worldwide by travelers. It infected a total of about 8,500 people, trimmed economic growth and cost billions of dollars in lost business. "We are certain that the human-to-human transmission of the virus stopped in July and it hasn't come back yet. But the virus is still out there," Peter Cordingley, WHO's head of public information in the Western Pacific region, told Reuters. "We think it's quite likely lurking in the wild animal population in southern China. There's absolutely no guarantee that it won't jump the species barrier again and come back." WHO officials and other medical experts have said they are not sure if SARS, which has no known cure, was a disease confined to winter months. "We don't know anything about this virus really. We know it has a name, but we are not sure where it comes from. We don't know how it spread," Cordingley said. He said the WHO does not expect a SARS vaccines to be developed soon because the scientific work on where the virus came from and how it spread to humans was not yet complete. Researchers in Singapore said last week they had developed a test kit capable of detecting the virus in 15 minutes. Other officials said flu cases reported recently in China, Hong Kong and the Canadian city of Vancouver turned out not to be associated with SARS. The WHO suspects that SARS originated from wild animals commonly used for food in China. "We think there is good reason to suspect that this virus comes from civet cats, raccoon dogs. We don't know which animal," Cordingley said. The WHO criticized Beijing's decision last month to lift a ban imposed in May on the sale of 54 species. In a recent study conducted on about 100 animal species by a team of Chinese and U.N. zoological disease specialists, some species showed a positive result for a virus similar to the one that causes SARS. "It's an internal matter of the Chinese government, and we don't have any policy-making rule in China, but we have told them that we think this is premature," Cordingley said. Animals suffer, too. It's time the Chinese learned that. The outbreak of Sars in Guangdong did not happen by chance. Strong evidence points to a connection between culinary practices involving wild animals in the province and the spread of Sars. Such culinary practices exist throughout China. Guangdong's food subculture, however, has taken this habit to an extreme. The consumption of wild animals and their exploitation for other purposes are a huge business in the province. In Guangzhou, any sympathy for animals is suffocated by a reckless drive for profit. According to the Hong Kong-based Animals Asia Foundation (www.animalsasia.org), truckloads of wild animals and pets are shipped to Guangzhou from all directions on the way to local restaurants. Some dogs and cats, on the road for up to 72 hours without food or water, are dying as they arrive in Guangdong. Restaurants in the province have killed as many as 10,000 cats a day to cater to the taste of their Cantonese customers. In thousands of markets, animals seriously injured in the wild by debilitating traps have been a common sight. Politics lies behind this lack of compassion. In the none-too-distant past, pet ownership was perceived in ideological terms as part of a "decadent bourgeois lifestyle" that eroded the fighting spirit of revolutionary society. The year 1958 witnessed an unprecedented campaign against animals, when Mao Zedong decreed that China's sparrow population should be exterminated. He reasoned that sparrows were pests because they consumed grain and thus reduced cereal production. So, they deserved to die. How? He launched a mass "kill the sparrows" movement. The entire society participated in a frantic killing spree, with truckloads of dead sparrows displayed by the government in Tiananmen Square. Like many other such ideological campaigns, the sparrow-killing movement was a disaster on all counts. In the absence of sparrows, their natural enemies - China's insect population - exploded the next year, with ruinous effects on the grain harvest. Grain production continued to fall. Some 30 to 40 million peasants perished in humanity's worst policy-induced famine. Another state-sanctioned mass campaign ordered the killing of dogs. But it was not just dogs and their owners that suffered. The campaign fanned the violence of the Chinese youth during the Cultural Revolution. A society that discourages compassion for the defenceless and promotes cruelty to animals, encourages violence almost by definition. No wonder the Red Guards never hesitated to use brutal tactics on so-called "class enemies". Teenagers were seen disemboweling live cats on the street. In northeast China, poachers are still setting illegal traps that, for example, caused the slow and agonising death of a Siberian tiger in the winter of 2001. Liu Hai-yang, a student at Beijing's prestigious Tsinghua University, became briefly famous last summer for an experiment in which he poured damaging chemicals on three trusting bears at Beijing zoo. Most shocking of all, perhaps, is the common culinary practice of chopping off the paws of live bears, because the paws of dead bears are said to be less appetising. Recently, pet owners have been abandoning their dogs and cats, fearful that the animals may be carrying the Sars virus. When Deng Xiaoping initiated China's economic reforms in the late 1970s, making it ideologically correct to seek wealth, one side-effect was an explosion in the wild animal industry. Hundreds of bear farms have been set up, and across China about 8,000 bears are kept in iron cages for the daily extraction of bile from an open wound in their stomachs. For years, the practice was praised by the government as a "brilliant innovation", producing revenue from bile exports and for pharmaceutical companies. Most people are blind to the cruelty. Even though Sars has highlighted the fact that the eating of wild animals is hazardous to public health, local officials have yet to change their mindset in viewing animals as easy targets. Like the sparrow-killing campaign, some local authorities have issued orders to kill pets. This did not solve anything, and the orders were imposed more for reasons of bureaucratic self-protection than for public health. Currently, Guangdong is taking steps to outlaw the trade and consumption of wild animals. Is it not time for authorities to seize the opportunity to foster a sense of concern for the other creatures that share the planet with us? GUANGZHOU: Li Baorong, 32, a wild animal wholesale dealer in Xinyuan Market, was sitting idly on a bench at 10 am. In the past, this was a booming hour for business. But these days, Li and nearly 300 other stallholders in the market have seen their business plummet on a daily basis. 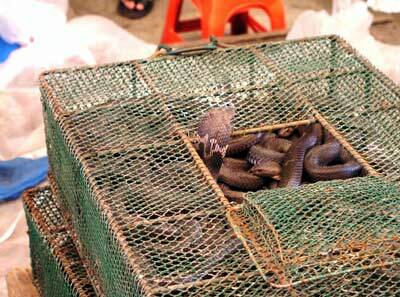 Xinyuan Market is one of the biggest trade centres for snake, fowl and other animals. Opened six years ago, it is located about 20 kilometres northwest of the centre of Guangzhou, capital of South China's Guangdong Province. There are a few other smaller animal markets in the neighbourhood. The area boasts around 1,000 traders engaged in the business of providing an array of live animals to the local catering industry. "I still hold a glimmer of hope for a recovery," said Li, "that's why I haven't left." But quite a number of traders have shut up shop and either headed for their hometowns in neighbouring Hunan Province or the Guangxi Zhuang Autonomous Region or are making plans to do so. The exodus began last Monday, when scientists announced that they had found a possible link between civets and SARS. On May 23 it was announced that research by experts with the University of Hong Kong and the Centre for Disease Control in Shenzhen revealed that a SARS-like coronavirus had been found in animal samples. Researchers cautioned about drawing hurried conclusions. However, the news had a potent effect on trade. Business went flat, even though local industrial and commercial administration officials, who have been making regular rounds in the market, say that none of the traders at Xinyuan have gone down with SARS. In each of the market's four 100-metre-long, 8-metre-wide corridors lined with plastic-covered stalls, one-third were locked with rolling iron doors. The rest, like Li's, are open but doing almost no business. Sitting on four stools around a table, a group play cards. Yawning is common these days. "It wasn't like this before the announcement that a SARS-like virus was detected in the animals," Li said. "Our business licences were collected by officials from the Industrial and Commercial Administration days ago," said Wang Guoqing, who has a neighbouring stall to Li and specializes in dealing with masked palm civets. The licence was jointly issued by the local Industrial and Commercial Administration and Forestry Bureau. Originally from Hunan Province, Li started his business selling and buying snakes, fowl and civets some 20 years ago. He lives with his wife and child in Guangzhou, but has to send money home to help support an extended family that includes his grandmother. Li insisted that he and other vendors "know very clearly what is permitted and what's on the national list for protection," he said. "Just one night everything changed," he said, adding that at present he is suffering a daily loss of about 200 yuan (US$24.2) in rent and other fees alone, before even taking into account his earning losses. Meanwhile, a restaurant, one of his customers, still owes him 108,000 yuan (US$13,043), for a consignment of snakes. When the link between SARS and animals was made the restaurant took dishes such as snake and civet off its menu. Unable to recoup its money by selling such food, the restaurant is not in a position to pay Li, he said with frustration. Like Li, Wang Guoqing, also from Hunan, said he is the main provider for his extended rural family. Wang claims that most of the civets in the market are raised on the farms, "whose fathers or grandfathers are the wild ones. "Raising civets is just like raising pigs, very easy," said Wang, who in the past occasionally kept a number of civets. "By nature they like to eat fruit, but the raised ones also can be fed with rice, adding some sugar into it would be better." From his experience and knowledge civets do not easily get ill. 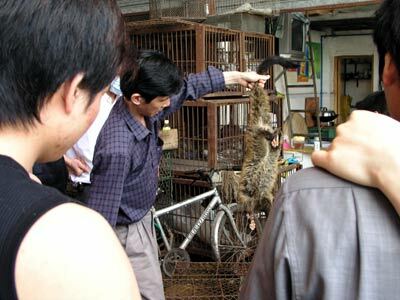 The cost of raising a palm civet is about 400 yuan (US$48.3) a year. Civets are ready for sale after only a year's nursing. The smallest weigh about 1 kilogram while the largest can weigh up to 7 kilograms. 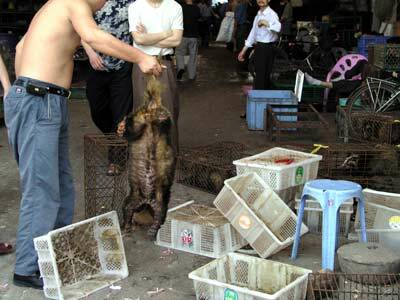 Palm civets sell at about 60 yuan (US$7.25) for half a kilogram, with top prices reaching of 80 yuan (US$9.6), Wang said. Right now an anxious Wang is at a loss as to what to do and indeed what the future will hold. BEIJING, June 2 (Xinhuanet) -- Two hundred and thirty-five civet cats kept by a Beijing farm have been put into emergency isolation after reports that a virus similar to severe acute respiratory syndrome (SARS) has been detected in the animal. Cai Fuchao, director of the Beijing municipal publicity department, said on weekend that both wild and farmed civet cats could be found in Beijing, but only in tiny numbers. As wild civet cats inhabited mountainous areas in the outskirtsand were nocturnal, there was little chance for human contact. Scientists have spotted a virus similar to the SARS virus in five wild animals, including civet cats. However, Cai noted that further in-depth research was needed toconfirm that civet cats or other wildlife were the original channel of the disease's spread to humans. HONG KONG - In Beijing's Fengtai district, a family living in an apartment building in the Niwa neighborhood suspected that its pet dog, a Pekingese, had become infected with severe acute respiratory syndrome (SARS). Upon suspecting their pet's infection, a member of the family promptly threw the dog from the family apartment's window, on the sixth floor of the building. The small but tough dog did not die after its fall on to the sidewalk below. When the family discovered this, they dug a small grave for the animal and buried it alive. What is it that is driving people to turn into brutal killers of the pets that, in many cases, they had cherished having at their sides for years? What is it that has caused many of China's pet owners to kill their beloved pets without even a shred of sympathy for the animals? As SARS has spread through China's cities and countryside this year, there has been a marked change in people's demeanor. The source of this change is unclear. What's most frightening is reports in local media of how in the blink of an eye spurious rumors or speculation have spread to every corner of the gigantic country - and how many people believe such things. A couple examples of this include the skyrocketing demand for vinegar to boil for disinfecting homes through fumigation and the far-fetched notion that drinking mung-bean juice could make one impervious to SARS. There's been no rhyme or reason to these episodes. Now that scientists are saying that the virus originally came from animals, a tragic fate has befallen the dogs of China. Scientists have yet to arrive at any final conclusions, but the masses appear to have determined that whatever animals they see on the street are as good as infected with the virus and that they therefore must be eliminated. Every local government is pushing extreme vigilance in the face of SARS, summed up by the expression "ying shi er sheng" (things will appear as the trend develops), and it seems that one after another, the people of various cities and counties are interpreting this government-issued call in their own ways. A group of Beijing children not much older than 10 chase a dog that had been hiding in a small nook. The dog had been abandoned by its owner. Some of the children are carrying poles as they chase from behind. Others are pelting the dog with stones as it runs. The group of children are laughing in a surprisingly callous manner. A boy in the group says that beating dogs is part of the fight against SARS. Nanjing's "Dog-Beating Corps" has come to the home of an elderly resident as a result of complaints from his neighbors. The man's neighbors informed the group that the man's trash had a "bad odor" to it. Hence, "with the blessings of the local police", the Dog-Beating Corps forces its way into the elderly man's home and bludgeons the eight stray dogs that the man has been caring for until they are all dead and then clean up the mess. The vast majority of the man's neighbors welcome this action and some even praise it. There are some panicking Beijing dog owners who fear that their pets are infected with SARS, but are unwilling to force their dogs on to the street where they will be beaten to death. Hence they go to pet clinics in hopes of having a veterinarian euthanize their dogs. Ever since the first SARS patient was discovered in the city of Hangzhou, a large number of people have been abandoning their pets on the street in order to avoid being infected. There's also a good many people who are calling the municipal government and asking that the authorities collect their pets from their homes and take care of them. These saddening snapshots effectively depict the confusion of SARS and how, once again, people who are desperate for answers are shooting arrows in the dark, hoping that their efforts will have some effect on a situation that is out of any individual's control. In this nationwide attack on dogs, there has been a constant war of words between the two camps divided by the issue. The advocates are people such as those in the Dog-Beating Corps in Nanjing, where local media have fueled the attack with bloody pictures reminiscent of the Nanjing Massacre committed by the Japanese army in the then-capital of China during World War II. Opponents are typically animal-rights activists who are, not surprisingly, outraged. These opponents offer the argument that it is not known for sure whether animals can transmit SARS to humans, but it is indisputable that humans are capable of transmitting the virus to other humans. If it's acceptable to kill dogs now, then surely it is acceptable to kill humans, they argue. Non-participating supporters of the attacks on dogs are quite numerous. The dominant view among them seems to be, "We should value the lives of dogs. At the same time, we should respect human life. There is no way that one can argue that a human's life has the same value as a dog's. SARS has already mutated, so we shouldn't underestimate the potential it has to wreak further havoc. So it's necessary to work constantly to protect human life." The wave of violence against dogs in Nanjing leaves one with a deeply troubling feeling. Despite the lack of any conclusive scientific evidence that proves that SARS can be spread to humans by animals, many people are deciding to slaughter the city's dogs out of suspicion, treating dogs as if they are not living creatures. At the present stage in China's SARS episode, the entire country from top to bottom should focus its energy, its time and its human, financial and material resources on learning practical and verifiable information from its experiences in the anti-SARS battle. There is no reason for the country to get tangled up in problems that don't exist. Fox, boar, raccoon dog -- name an animal and it might be on the menu. Many are listed by China as endangered species, meaning it should be illegal to catch them, but enforcement is lax. HONG KONG, China -- Scientists say antibodies found in workers who handled exotic animals at a food market in southern China supports their theory the SARS virus jumped from animals to humans. In a random study of ten market workers in Guangdong's capital of Shenzhen, researchers from the University of Hong Kong and the Shenzhen Disease Prevention and Control Center, found five were carrying SARS antibodies, disease-fighting chemicals that give evidence of infection. Cats at a wild animal market in Guangdong. But none of them could recall being sick, which suggests they had mild infections, The Associated Press quoted WHO SARS virologist Dr. Klaus Stohr as saying. The findings indicate workers caught the virus from the animals, developed a mild form of the disease, but then the virus mutated into a more virulent form before it was passed to other people, Shenzhen microbiologist He Jianfan told AP. Last week, scientists said they had found the SARS virus in three species of mammals for sale at the Dongmen Market -- civet cats, raccoon dogs and badgers -- giving researchers some more clues in a puzzling disease. Even as scientists rush to find the origins of SARS and a possible vaccine for it, in neighboring Hong Kong leaders on Wednesday asked a panel of international experts to help them prepare for future disease outbreaks. The group, comprising nine medical experts from around the world, will come up with a report with recommendations by September, Chief Executive Tung Chee-hwa told a news conference. The flu-like virus has killed 270 people and infected 1,730 in Hong Kong after it jumped across the border from the neighboring province of Guangdong. Authorities have raided wildlife markets and ports of entry in southern China's Guangdong province, seizing thousands of mammals, birds, snakes and other animals to stamp out the source of SARS, state press said Wednesday. More than 10,000 wild animals have been seized over the past two days at Baiyun Airport in the provincial capital Guangzhou alone, the Xinhua news agency said. Pre-dawn raids have been conducted at Guangzhou's notorious animal markets, with officers catching vendors by surprise as they arrive to unload their creepy, crawly, feathery or furry goods. The captured beasts -- which were destined for dining tables -- include 267 pheasants, 54 foxes, 30 night cranes, 30 sparrows, 20 turtledoves, 25 kilograms of snakes and six martens, a weasel-like mammal. They are the latest focus of China's ongoing battle to curb the spread of the virus which causes the new global disease Severe Acute Respiratory Syndrome, believed to have originated in Guangdong. Findings from joint research conducted by mainland China and Hong Kong scientists indicate the disease originated in wild animals, including civet cats and racoon dogs, and likely jumped to humans. Both animals are widely traded and eaten in Guangdong. But since the findings were announced last Friday, vendors have quickly removed these types of wildlife from markets. The government now wants to stop the habit of eating wildlife in general and seize all hunted and farmed game. In a matter of three hours, all the traders at Guangzhou's largest wildlife trading center, the Xinyuan Market, were arrested. The report did not say on what charges they were detained, but many vendors sell endangered species, such as the masked palm civets and pangolins. Besides airports and markets, police in Guangdong also inspected restaurants, train stations and ports to crack down on a trade that has become highly lucrative, driven by rising incomes and culinary desires. Daily earnings at the Xinyuan and three other markets in Baiyun district exceed one million yuan (about 120,000 US dollars), Xinhua said. In Xinyuan market alone, earnings could reach as high as 1.9 million yuan (230,000 dollars) a day, with the annual income topping 700 to 800 million yuan (85 million to 97 million dollars). BEIJING - Beijing is to crack down on the eating of civet cats after research by a Hong Kong scientist showed it was likely the SARS virus that has killed almost 700 people worldwide jumped to humans from the animal. The latest study linking wild animals such as civet cats to the coronavirus that causes SARS has forced governments to take stricter measures to stop their trade and consumption. The research, released on Friday and Saturday, has produced wide repercussions throughout the country, especially in South China's Guangdong Province. Local government and non-governmental groups are now attempting to halt the practice of eating wild animals. Some experts in Guangdong have urged the government to ban the sales of wildlife and strongly enforce the move. According to regulations in Guangdong, people who knowingly eat dishes that contain animals on the State protection list will be fined 10,000 yuan (US$1,205) - three times the average monthly salary of locals. The legislation body in Shenzhen is drafting a regulation to forbid the hunting, processing, purchasing, slaughtering and consumption of wildlife. The first version is expected to come out soon. In Beijing, wildlife protection departments have launched a thorough inspection into the trade of wild animals in the city, including civet cats. Experts with the Ministry of Agriculture found that the genetic order of the SARS virus was identical to the genetic order of the coronavirus that can be found in animals like bats, monkeys, civet cats and snakes. The animal coronavirus investigation team has collected 1,700 animal samples from 59 species, including various kinds of domestic livestock, wildlife, aquatic animals and pets, all of which possibly come into contact with humans. But how the SARS or SARS-like coronavirus jumped from wildlife to the human race and caused the outbreak of the disease is still being studied. Researchers in Hong Kong also announced on Friday that they have charted a complete genetic map of the SARS-like coronavirus detected in the Himalayan palm civet, which shares 99.8 per cent of the genetic code of the SARS coronavirus. The scientific research also ruled out pets and other domestic livestock as the source of the disease as the two have a different coronavirus genome. Experts have called for dogs, cats and other family pets to be treated humanely as some have been abandoned due to fears they might have been responsible for spreading the flu-like virus. According to Doctor Tian Kegong from the veterinarian diagnosis centre at the Ministry of Agriculture, no animals in China have died from the disease. "We are still looking into the issue, but there has been no evidence so far to show any possible SARS transmission through domesticated dogs and cats," he added. SARS has been a nightmare for not only people but also their pets. Many people have reportedly begun to desert or even kill their pets for fear of catching SARS from the animals. But these knee-jerk reactions have no scientific basis and will only aggravate the situation. The over-reaction is largely attributable to some media reports that pets like dogs or cats could carry and spread the SARS virus. Last week, scientists from Shenzhen and Hong Kong linked Himalayan palm civet to the coronavirus that causes SARS. Scientists in Hong Kong have charted a complete genetic map of the SARS-like coronavirus detected in the catlike mammal found in the wild, which shares 99.8 per cent of the genetic code of the human SARS coronavirus. But, as many experts have noted, there is no evidence indicating that household pets are carriers of the virus. Wild animals are not the same as pets. Some experts say that since family pets share the same environment as their owners, no serious problems should arise so long as the same quarantine measures that apply to humans are taken for pets. The latest findings indicate that humans could be responsible for the first case of SARS because of their own actions - for example, eating wild animals. These appetites could result in the transmission of a virus from their animal carriers to people. Abandoning pets will not help to prevent the spread of SARS. Instead, people should give up bad practice such as random spitting and eating wild animals. Authorities in Beijing, China are soon going to begin relocating to remote areas or killing pets belonging to individuals who have been quarantined in order to prevent the virus that causes Severe Acute Respiratory Syndrome (SARS) from spreading. The disposition of each animal will depend on the section of the city in which he or she is being kept. "We must cut off any possible sources of infection to fight against SARS," said one Beijing police officer. In Nanjing, dogs are banned from streets, parks and other public places. "They must stay at home with their owners," said a Nanjing police spokesperson. "If seen outside, they will be rounded up and killed." For a virulent virus seeking to jump from animals to humans China's Guangdong province may be the perfect habitat. Along the highways, ubiquitous farms are lined up next to each other, with farmers tending their ducks, chickens, and pigs in teeming and cramped quarters. 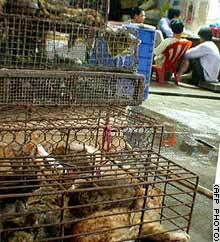 In the city's food stalls, meanwhile, vendors keep their meat�alive and dead�in cages and baskets stacked on top of each other. Customers can choose from a menu of rats, cats, dogs, frogs, snakes, and exotic birds. In such unhygienic conditions, scientists have long warned, it's just a matter of time before a hidden and potentially lethal virus would make the leap from animal to man. It should come as no surprise, then, that one virus�the enigmatic coronavirus that causes severe acute respiratory syndrome, or SARS�in all likelihood did. Many wild and exotic animals are sold as food in China, such as these racoons in stacked cages at the Qingping Market in Guangzhou. Some scientists warn that such conditions are ideal for a virus to jump from animals to humans, which likely happened in the case of SARS. Among the first people to die from SARS, when the epidemic began in the southern Guangdong province late last year, were food handlers. Since then, at least 6,583 people in 30 countries have been infected with SARS. As of yesterday, the disease has claimed at least 461 lives. China has an unfortunate history of producing new viral strains. Two devastating influenza pandemics, in 1957 and 1968, both originated in China, each killing more than a million people. Experts maintain that outdated farming practices, overpopulation, and even political secrecy may be to blame. "China is the perfect breeding ground for new viruses," said Christoph Scholtissek, a German virologist whose research has linked China's traditional farming system with the emergence of lethal human viruses. Although researchers have�in record time�managed to crack the genetic make-up of SARS, the mysterious virus doesn't match any known animal or human viruses. In other words, scientists still don't know the source of SARS. Many emerging infections already exist in nature. They may enter humans as a result of changed ecological or environmental conditions that place humans in contact with previously inaccessible pathogens or the natural hosts that carry them. "The most likely scenario is that [SARS] has been circulating in another species in southern China, and human beings came in contact with it this past autumn," said Stephen Morse, an epidemiologist at Columbia University in New York and author of Emerging Viruses. Known as "zoonosis", the virus transfer from animals to humans has long been established. Foreign microbes can be lethal because the new host may not have the immunity that has built up over time in the original species. Some virologists believe traditional farming practices in China help spread new viruses. Chinese farmers raise ducks, pigs, and fish in one integrated system, and the animals may exchange viruses through their feces. Ducks can pass avian flu viruses to pigs, where two viruses can mingle and form a new strain that is passed on to the farmers. The pigs, which have a genetic make-up similar to humans, act as the "mixing vessels." Eurasian avian influenza viruses have been recognized as the precursors to the influenza virus genes that re-assorted with human strains to generate the 1957 and 1968 flu pandemics. However, Scholtissek, who linked China's agricultural practices with those influenza pandemics, said it's unlikely the same thing happened with SARS. While the flu virus' genome is divided into eight separate strands, which can break up and easily mix and match individual pieces to come up with brand new variants, the SARS virus consists of a solid genome. But very little can be said with certainty about the SARS virus, partly because it's believed to be mutating all the time. Hong Kong scientists this weekend said the SARS virus is mutating rapidly into at least two forms. "This rapid evolution is like that of a murderer who's trying to change his fingerprints or even his appearance to escape detection," said Dennis Lo, a chemical pathologist at the Chinese University of Hong Kong. There is little doubt that crowded conditions, like those in China, play a major part in the spread of SARS. Shoppers in Guangdong province, which has a population of 76 million, throng the busy markets for fresh meat. The need to feed a growing population has greatly increased the number of animals raised. "Viruses transfer when you have a density of population of people and animals," said Ian Jones, a professor at the School of Animal and Microbial Sciences at the University of Reading in England. "Given that about a quarter of the world's population is living in China, things are just bound to pop up there." As people expand into ever-wilder areas, humans are coming in closer contact with wild animals. In southern China, wild and exotic animals like snakes and birds are treated as delicacies with many people believing they are good for one's health. Michael Lai, a professor at the University of Southern California in Los Angeles and an expert on coronaviruses, believes that SARS existed in a wild animal, most likely a wild bird, before transferring to humans. "The SARS viral sequence is different from any known human or animal," said Lai. "The sequence and genome structure of the SARS virus most closely resemble those of an avian coronavirus, [though] it also has a hint of a murine [or rodent] coronavirus." Add to the mix the Chinese government's capricious handling of the SARS outbreak. Although doctors in southern China were aware of the epidemic as early as January, information about the disease was kept secret by the government for months. It only began to emerge at the beginning of April, under intense international pressure. For months, doctors in places as far-flung as Canada scratched their heads as new cases of a mysterious pneumonia-like disease arrived at their hospitals. Health officials now charge that the epidemic could have been contained sooner if the Chinese government had been more forthcoming with information about the epidemic. Beijing - China is rounding up dogs and cats from Sars patients' homes and killing them for fear canines and felines will spread the deadly disease to humans, officials said on Wednesday. Although veterinary experts said there is no evidence severe acute respiratory syndrome (Sars) can be transmitted to humans from household animals, the furry beasts are nevertheless coming under suspicion. The Beijing city government recently issued an order for police to seize pets from homes where people have been infected with Sars, an official at the city's police department office in charge of pet control said. "Pets can spread diseases. People can take measures to prevent diseases being spread, but not pets," said the official. "If a family has Sars and they have pets, we will catch and kill the pets regardless of whether they show Sars symptoms." Authorities have already found several dogs with Sars, said the official, who declined to reveal her name. China requires pet owners pay stiff fees, reaching several hundred US dollars a year, to own pets. While Beijing police have sometimes turned a blind eye to illegal pet ownership, they appeared now to be actively enforcing the law. "If we find any stray dogs or cats or if anyone make reports to the police about people illegally raising pets, we will send people out to catch the animals and deal with them," the official said. In the eastern city of Hangzhou, police recently netted 183 dogs, after receiving an unusually high number of reports from people telling on their neighbors illegally owning pets, the China News Service said. Some of the pets were collected after pet owners called pet control officials to collect them, while others were abandoned by their owners, who became worried the animals could spread Sars. In several suburbs in the city, abandoned dogs were seen aimlessly wandering around in a filthy state, searching for food, the report said. A pet owner in Beijing's Fengtai district tossed his Pekinese dog from his six-floor apartment Monday because he suspected the dog had Sars, the Beijing Star Daily said on Wednesday. The dog had suffered from a high fever and had not eaten for days. It did not die right away, but the man buried it alive, the report said, citing an official from the suburb committee. Police later arrived to disinfect the burial site. A veterinarian at the China Agricultural University's veterinary hospital in Beijing said dogs and cats have all along carried a form of the coronavirus, but have never been known to transmit it to humans or between dogs and cats. "It's not necessary to disinfect pets or discard pets," she said. SHUNDE, China An hour south of Guangzhou, the Dongyuan animal market presents endless opportunities for an emerging germ. In hundreds of cramped stalls that stink of blood and guts, wholesale food vendors tend to veritable zoos that will grace Guangdong Province's tables: snakes, chickens, cats, turtles, badgers, frogs. And, in summer, sometimes rats, too. They are stacked, one on top of another, in cages that in turn serve as seats, card tables and dining quarters for the poor migrants who work there. On a recent morning, near stall 17, there were beheaded snakes, disemboweled frogs and feathers flying as a half-alive headless bird was plunked into a basket. If you were a coronavirus, like the one that causes severe acute respiratory syndrome, known as SARS, it would be easy to move from animals to humans in the kitchens and food stalls of Guangdong, a province notorious for exotic cuisine prepared with freshly killed beasts. Indeed, preliminary studies of early SARS victims here in Guangdong have found that an unusually high percentage were in the catering profession - a tantalizing clue, perhaps, to how a germ that genetically most resembles viruses that affect chickens and rodents has been able to infect thousands of humans. One of the earliest victims, in December, was a seller of snakes and birds here who died of severe pneumonia at Shunde's First People's Hospital. His wife and members of the hospital staff contracted it as well, setting off an outbreak that now sounds eerily familiar. Around the same time in December, Huang Xinchu, a chef, was admitted to the Heyuan People's Hospital, 160 kilometers (100 miles) to the north, ultimately infecting eight doctors there. On Jan. 2, another desperately ill chef was hospitalized in the city of Zhongshan, south of Shunde, setting off an outbreak. In early January, alarmed health departments in Shunde, Heyuan and Zhongshan all reported the strange pneumonia clusters to the Guangdong provincial authorities, who concluded that they were facing a highly infectious pneumonia caused by a previously unknown agent. It is unclear whether that conclusion was passed on by provincial officials to the Ministry of Health in Beijing, or ever reported to international health agencies that might have conducted an early investigation into the problem. Instead, it would be two and a half months more before the strange pneumonia had a name, coined only after an Italian doctor working in Hanoi alerted the World Health Organization about a similar new pneumonia he was seeing. And it would be three and a half months before China's leaders would admit that their country had an epidemic of SARS. From January through the middle of March, doctors in Asia and Canada were encountering patients carrying a virulent and highly contagious germ, unaware that they were facing potentially lethal infection. During that period, hundreds of health workers fell ill. Well-meaning doctors were placing SARS patients in ordinary wards - as they would patients with normal pneumonia. Those patients were passing the infection on to hundreds of others. Scientists have always considered the teeming farms of southern China, where animals and people crowd together, as ideal breeding grounds for new human viruses, which can jump across species under such conditions. So it was no surprise in March when the World Health Organization said it believed that SARS had originated in Guangdong. But when a World Health Organization delegation went to look at data on the earliest SARS cases, it found few farmers among the victims. Instead, what jumped out was an odd preponderance of food handlers and chefs - about 5 percent of the first 900 patients, as opposed to less than 1 percent among patients with normal pneumonia. Even if food handlers turn out to be the conduits through which SARS passed from animals to humans, all evidence points to human-to-human transmission now. Still, for much of December and January, small cities around Guangzhou were fighting, and often winning, localized battles with the strange pneumonia that would later be named SARS. Word of the disease spread among local doctors so that when another chef with pneumonia went to Zhongshan Hospital on Jan. 2, short of breath and feverish, he was isolated in intensive care. But it was not soon enough. Thirteen medical workers were infected, who in turn infected 15 others in Zhongshan. Outbreaks in Shunde, Heyuan and Zhongshan peaked in January. By February the virus was poised to move on. By early February, sick and frightened patients from small cities like these were traveling to more advanced hospitals in the provincial capital of Guangzhou - and that is when the surge of cases really began. From Feb. 2 through Feb. 4, a very sick man from Zhongshan made the rounds of emergency rooms in Guangzhou as treatment did not improve his condition. Dozens of health workers were left infected. The man was a superspreader - a SARS patient who is highly infectious. Dozens of doctors and nurses fell sick at the Zhongshan No. 2 Hospital, where he was finally admitted. On Feb. 21, Dr. Liu Jianlun, 64, a lung specialist from the Zhongshan hospital, attended his nephew's wedding in Hong Kong, though he was running a fever. At the Metropole Hotel, where he stayed, he passed SARS to other guests, including two Canadians, an American businessman en route to Hanoi, a Hong Kong man, and three young women from Singapore. Guangzhou, China -- Here, at the epicenter of the disease known as SARS, dinner can be bought live at a "wet market." Just outside the banking and commercial center of the capital of Guangdong Province stretches a wide, congested boulevard lined with machine shops, auto parts vendors and industrial parts outlets. Delivery trucks, lumbering buses and darting taxis vie for position. Nestled amid the enterprises is Chau Tau market. Here, restaurant chefs and home gourmets, even traditional medicine makers, shop for exotic live animals, the much-desired delicacies of Cantonese cuisine. Guangdong is known for its consumption of snakes, turtles, a range of birds, assorted rodents and wild mammals, even cats and dogs. The emphasis is on delicacies and variety. But freshness is utmost. So animals are purchased live and either butchered on the spot or in the buyer's kitchen. A customer examines a hog nosed badger in the Chau Tau Market, Goungzhou, China. World Health Organization officials are trying to determine whether there have been unusual die-offs of the sorts of wild animals consumed at dinner tables here -- whether it's possible that a species was harboring the virus now known to be potentially fatal to humans. Science has long recognized zoonosis -- animal-to-human disease spread -- and that possibility is under study in the SARS outbreak. But the range of animal possibilities is vast -- beyond even those arrayed in markets such as Chau Tau. "This is very different from the United States, where you buy meat frozen or prepared" and have a limited choice of meats, explained Dr. Yuen Kwok-yung, a microbiologist at Hong Kong University. "In Chinese -- Cantonese, really -- this list is enormous. More than 40 species, at least. And the markets are right there, with live animals. So zoonosis is quite common in this sort of area." 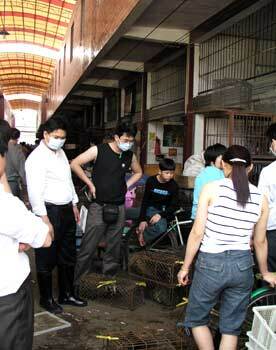 Wearing facemasks, potential customers examine badgers at the Chau Tau Market. There is, of course, no way to know if this market, or others like it elsewhere in the province, could have been the source of the severe acute respiratory syndrome virus. "I think at this moment we don't know," the WHO's Dr. Henk Bekedam said in a news briefing in Beijing Tuesday night. "It will be very important to understand where it came from. We have been invited by the Guangdong government to come there and hunt now for where it came from. ... We are getting a team together now." A view of Chau Tau Market. The virus that causes SARS is novel. And that very novelty argues that the microbe is not normally found in animals that come in close contact with humans, such as pets and livestock. Guangzhou doesn't seem a likely place to find people and wild animals living in close proximity. The most recent Chinese census puts the city's population at about 11 million, but experts say it could be closer to 13 million. The city is not unlike Los Angeles -- sprawling, crisscrossed by freeways. Guangzhou's most constant sound is construction noise, and the favored commercial architectural style is the glass-concrete-and-steel high-rise. Aside from a few city parks, the city is a concrete center of commerce and manufacturing in southern Guangdong, a Cantonese area that borders Hong Kong. Reptiles and animals such as these Indian cobras are on sale as delicacies. The Chau Tau market is an open-air warehouse space roughly the size of a New York City block. Animal dealers lounge about, playing mah-jongg, while their merchandise wiggles, claws and writhes in stacked cages, red plastic tubs of water or large mesh bags set on the concrete floor. The air is almost intolerably redolent of the urine and feces of dozens of species, including that of the human vendors. When the stench can no longer be tolerated, a large power hose is used to wash the filth away, effectively aerosolizing much of the muck into breathable droplets. The merchandise is arranged in sections: Rows of freshwater and sea turtles in the reptile section, from palm-sized creatures to 40-pound terrapins. Close inspection reveals alligator snapping turtles from the United States, Burmese beak turtles, terrapins from Malaysia and Chinese box and softshell turtles. Animals such as these Asian rat snakes are also on sale as delicacies. An Indian cobra pops its hooded head from a cage as thousands of snakes writhe in mesh bags or cages. A vendor advises a visitor to step away from sacks of Asian pit vipers and Russell's vipers. Cages packed with wiggling black Asian rat snakes are stacked like crates of oranges. Larger serpents lie in compact coils. The exotic bird section ranges in size from small songbirds to ostriches. Guinea fowls, pigeons, doves, peacocks, swans, with a variety of ducks and chickens, cower in cages or bump furiously against one another in large pens. A wild animal dealer transfers a hog-nosed badger into a small cage. There's a section for dogs, which languish in pens. And dozens of cages are filled with cats that, on close examination, appear sickly, their eyes glazed and paws worn bloody. The largest section of the market, spanning four rows about 100 yards long, features mammals caught in the wild, those captured by trappers from the mountains, swamps, forests and plains of China and southeast Asia. Chinese giant flying squirrels try to stretch their webbed arms in cramped cages. Masked palm civets hiss at passersby. Hog-nosed badgers squirm, waving their long claws as a salesman stuffs them in cages. Ferret badgers rub their noses raw and Chinese porcupines huddle in cage corners. Vietnamese pygmy pigs, red-striped pigs, wild boars and a host of other wild swine snort from behind bars. A range of wild rodents are packed into cages: Chinese bamboo rats, nutrias, moles, mango rats, guinea pigs. Over boxes of shiny black guinea pigs are signs proclaiming "Chinese Viagra," a reference to a belief that the animals cure male impotence. Many of the animals are obviously sick, and some had chewed off their limbs in apparent attempts to escape chains or traps. If the animals harbor bloodborne pathogens, there is plenty of opportunity for human exposure. A number of species of small antelopes and deer are available. At one booth a dealer had placed a Sichuan barking deer on an intravenous drip. "It's running a fever," the dealer explained. "I'm saving it," because buyers will purchase only living animals. Until two years ago, Chau Tau market was located outdoors, in Qingping Shichang park. But authorities cracked down on the vendors because tourists and world wildlife conservationists found the public market objectionable. Chau Tau was moved to the busy industrial boulevard, initially in an enclosed building. Chau Tau was indoors in November, when the first SARS case was reported: 46-year-old Pang Zuoyao. Pang's home is about 12 miles away in Foshan, and Chinese health authorities say he received treatment in both cities. The virus subsequently spread to his family and health care workers.